Archangels are fierce. They're absolute. They're Heaven's most terrifying weapon. Archangels are the stuff of primordial creation (Michael, Lucifer, Raphael and Gabriel) they are the first four powerful, angelic beings created by God before other angels. They possess immense power far surpassing that of demons, lesser angels, and most other supernatural beings. Castiel describes them as "fierce and absolute." God and His archangels battled the Darkness, where the Darkness was eventually defeated and trapped to maintain the Cosmic Balance. To serve as lock and key to the Darkness' cage, God created a Mark. It was given to Lucifer, His most trusted archangel. The Mark eventually began assert a will of its own, corrupting Lucifer, and becoming the first curse. The Mark enhanced Lucifer's anger and jealousy when God commanded the angels to bow before humanity. Lucifer began arguing with his brothers, primarily Michael, who loyally followed their Father's word as law. Lucifer led an unsuccessful rebellion in Heaven, which caused him to be cast out and to fall from grace. He was subsequently imprisoned in a Cage by Michael. Gabriel was in turn disgusted with his brother's behavior. He refrained from choosing sides by retreating to Earth and masquerading as the Trickster, Loki. In God's absence, Michael took over the entire Host of Heaven while Raphael continued his responsibilities as an archangel. According to Metatron, the archangels, in their despair decided to take over the universe themselves after God left Heaven. Metatron realized that he and the Word of God were needed to do so, so he fled to Earth seeking refuge for the tablets and himself. The archangels were unable to locate Metatron due to his extreme isolation from Heaven, and their plans were delayed. Metatron was also cut off from Heaven making him unaware of the archangel's fates until contact with the Winchester brothers. In the demon tablet, Metatron is falsely identified as an archangel. At some point in the past, the archangels were believed to have killed all of the Knights of Hell with the First Blade. However, it is revealed that this task was actually undertaken by Cain. As the plan to release Lucifer and the Apocalypse starts to come to fruition, the archangels once more begin playing a role on Earth with Raphael taking on the role of a protector of the prophet Chuck Shurley and later smiting a group of demons at a gas station after the release of Lucifer. Once Lucifer is free, Michael begins working through his proxy Zachariah to force Dean to consent to possession so he can have his destined battle with Lucifer. Gabriel, as the Trickster, attempts to convince the Winchesters to "play their roles" as well. During the Apocalypse, Gabriel is presumably killed by Lucifer while helping the Winchesters and Kali escape, but not before giving them a way to lock Lucifer away once more. During the final confrontation between Michael and Lucifer at Stull Cemetery, Sam Winchester is able to overpower Lucifer's control of his body and throw himself, Lucifer, Michael and Adam Milligan into Lucifer's Cage, leaving Raphael as the only active archangel. Following the imprisonment of Michael, Raphael takes command of Heaven with the intention to release Michael and Lucifer and once again begin the Apocalypse. This causes a divide in Heaven with Raphael and his loyalists against Castiel and angels loyal to him. In order to defeat Raphael, Castiel forms a deal with Crowley to gain access to all the souls of Purgatory to gain the power he needs. After betraying Crowley, Castiel takes all of the Purgatory souls for himself and uses their power to obliterate Raphael. With the release of the Darkness, Sam begins getting visions he believes are from God telling him to go to Lucifer's Cage. Using the Book of the Damned with the help of Rowena, Sam is able to summon Lucifer into a smaller warded cage in Limbo where Lucifer tells Sam that he can defeat the Darkness if he is released once more upon the world in a vessel. While holding Sam captive in the cage, Lucifer tells him that he is the only archangel left capable of giving any sort of help as Raphael and Gabriel are dead and Michael has been driven insane by life in the Cage and is of no use to anyone. Though Sam refuses, Lucifer is able to secretly escape by taking Castiel as a vessel and takes control of Hell and briefly Heaven. The Winchesters are eventually able to get Lucifer and God to reconcile, but God is unable to resurrect Raphael and Gabriel in a timely manner to help against the Darkness or call upon Michael for help in his state. With only one archangel to help them, witches, demons and angels are all called upon to substitute for the missing power to defeat the Darkness. Though the Darkness is defeated, she recovers and mortally wounds God, expelling Lucifer from Castiel in the process. After God departs the Earth, Lucifer believes he has once more been abandoned by his Father and that God was just using him, causing Lucifer to decide to "break God's toys." Lucifer, possessing the President of the United States, conceives a Nephilim child with a presidential aide, Kelly Kline. The act of conception draws an immense amount of cosmic energy, which alerts Heaven and all angels. 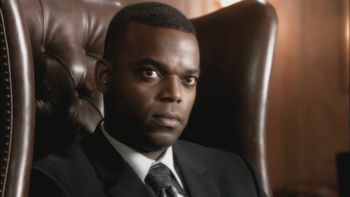 After Sam Winchester is able to eject Lucifer from President Jefferson Rooney, due to Crowley's machinations, he is sent to his former vessel, Nick, whose body had been repaired, upgraded and warded to act as a permanent prison for Lucifer, allowing Crowley to gain a measure of revenge. Lucifer eventually breaks free of Crowley's control, and upon seeking out his soon-to-be-born son, Lucifer is locked away in a post-apocalyptic alternate universe by the Winchesters, Castiel, and Crowley, costing the lives of Castiel and Crowley and trapping Mary Winchester with Lucifer. Trapped in Apocalypse World, Lucifer is captured by the Michael of that world. Having killed his Lucifer when the Apocalypse happened, Michael rules Apocalypse World and leads the angels in a genocidal war against the human race. Learning about the main universe from Lucifer's mind, Michael becomes determined to lead an invasion. An attempt to open a portal between the worlds leads to Lucifer's escape from Apocalypse World, but with his grace partially extracted by Michael. Lucifer warns a resurrected Castiel of the threat which Michael represents, while the last Prince of Hell Asmodeus finds out as well and captures the two. Lucifer eventually escapes by working with Castiel who warns the Winchesters about the threat from the alternate Michael. With the help of Anael, Lucifer leverages his way into ruling Heaven by claiming that he can make new angels and restore the angels' wings. However, this turns out to be a lie and Lucifer subsequently abandons his rule to search for his son. Having ended up in Apocalypse World following an attempt to rescue Mary Winchester, Lucifer's son Jack Kline is captured by Michael, who tries to use Jack's power to open a portal between the worlds to lead an invasion force through. Jack and Mary eventually manage to escape Michael's custody and after seeing the state of the human race on Apocalypse World, Jack decides that he needs to kill Michael to save Apocalypse World. Jack and Mary subsequently form a human resistance against Michael. In the main universe, Asmodeus prepares for the upcoming invasion by getting the archangel blade -- the one weapon that, in the hands of an archangel, could kill another archangel such as Michael and Lucifer. Asmodeus reveals to Ketch that Gabriel is still alive and Asmodeus' prisoner. Ketch subsequently discovers that Asmodeus has been regularly injecting himself with Gabriel's grace to power up. Following a beating by Asmodeus, Ketch rescues Gabriel and steals the archangel blade as well as Asmodeus' store of Gabriel's extracted grace. 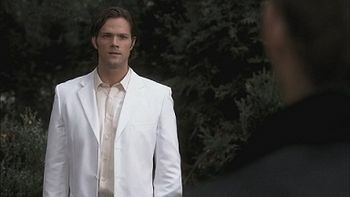 In exchange for sanctuary, Ketch delivers Gabriel, the archangel blade, and the grace to the Winchesters at the Bunker. While trying to treat the injured and traumatized Gabriel, Sam and Castiel discover that Gabriel had faked his death when Lucifer "killed him" during the Apocalypse so that he could abscond from his duties and return to a life of personal enjoyment before he was captured and imprisoned by Asmodeus. Asmodeus eventually tracks Gabriel to the Bunker and attacks, but Gabriel snaps out of his traumatized state and fights back, killing Asmodeus. Rather than help with Michael's impending invasion, Gabriel once more chooses to abscond from his duties and leaves. Castiel later visits Heaven for help with finding Gabriel and discovers that with less than a dozen angels left alive, Heaven is on the verge of crumbling, with Gabriel being the last hope to save it. 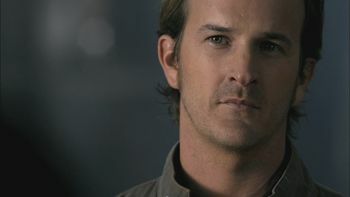 After the Winchesters help him to get revenge on Loki and his family, Gabriel agrees to help them fight Michael. In an effort to power the portal for as long as they will need, Gabriel and Rowena capture Lucifer to use him as a continuous power source for the spell while Gabriel joins the Winchesters in traveling to the Apocalypse World. Upon learning from Rowena that his son is in Apocalypse World, Lucifer breaks free of his bonds and travels through the portal where he finds and resurrects a recently-deceased Sam, making a deal with Sam to help him in exchange for Sam's help in bonding with his son. Lucifer and Gabriel assist in evacuating many of the residents of Apocalypse World through the portal, but are confronted by Michael. In the fight that follows, Michael kills Gabriel and Lucifer is stranded by Sam in Apocalypse World. Lucifer subsequently makes a deal with Michael to work together to reopen the portal and conquer the Winchesters world. 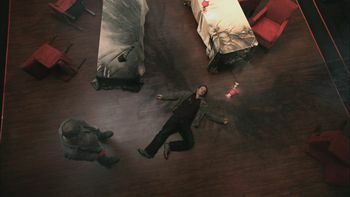 Shortly afterwards, Lucifer and Michael arrive in the Winchesters universe and Lucifer succeeds in tempting Jack to leave with him while Michael attacks the bunker. However, Jack returns in time to defeat Michael and turns on Lucifer when Lucifer's own actions are revealed. Lucifer steals the grace of his son, leaving Jack powerless and Lucifer super-charged. With Lucifer poised to destroy everything in creation and remake it as he wishes, Dean makes a deal with Michael where he will become Michael's vessel in exchange for Michael powering his fight with Lucifer while allowing Dean to remain in control. Powered by Michael, Dean fights Lucifer and ultimately kills him with an archangel blade. However, Michael betrays his deal with Dean, seizes control of his body and departs, loose upon the world and in his true vessel. Raphael descending from Heaven to protect the prophet, Chuck Shurley. According to Castiel, archangels are known in Heaven as absolute, precise and wrathful creatures. Like all angels, their true forms are very intense, and have proven not only harmful but possibly fatal to humans. Their presence outside a vessel is often visualized as a blinding white light, and their arrival can cause minor tremors, as shown by Lucifer when the St. Mary's Convent shook as he escaped the Cage, and by Raphael while intervening to protect Chuck. They may also emit a piercing sound, which has proven to be excruciating to humans. During a subsequent appearance, Raphael causes the entire Eastern Sea Board to experience a blackout. Shortly before his defeat, Lucifer's presence causes the temperature to drop drastically in Detroit. It has been stated that Michael and Raphael are tethered to prophets, and Gabriel served as God's greatest messenger. As mentioned previously, Raphael seemed to be the one who monitored and protected Chuck Shurley. Before his fall, Lucifer was God's most beloved angel; he was considered beautiful, and was well respected in Heaven. Archangels view themselves as the highest authority over all of creation since God's departure from Heaven. As leaders in Heaven, Michael and Raphael commanded the Host of Heaven, issuing orders to the "Senior Management" who were responsible for deploying angels to Earth. They did not share all their plans, especially their intention to allow Lucifer to be freed, to avoid rebellion in the lower ranks. Most of them show little respect while interacting with humans, although Gabriel eventually confesses his appreciation of humanity. The relationships between archangels and their vessels can be complex. Holding an archangel is damaging to a human; Raphael's vessel, Donnie Finnerman, was left catatonic after his possession. 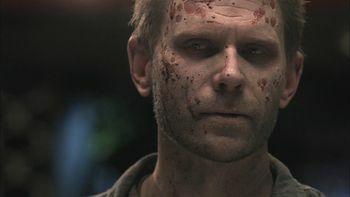 Lucifer's continued presence in Nick, an alternate vessel, causes the human's body to break down, as evidenced by burn-like marks on his skin. Lucifer's vessels can be strengthened with demon blood to better survive the ordeal. 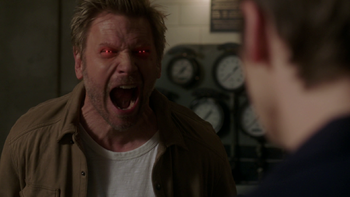 Despite his contempt for humanity as a whole, Lucifer showed some sympathy toward Nick, and toward Sam, his true vessel. Michael, though condescendingly, was willing to explain his position to Dean while occupying his father, and promised not to leave Dean a "drooling mess" like Donnie Finnerman after his service. Lucifer also displayed the ability to use Castiel, a lesser angel as his vessel without causing visible damage to the body. However, Castiel is noted by Sam to have a particularly strong vessel and Castiel later states that being Lucifer's vessel is in fact slowly burning both it and him out. 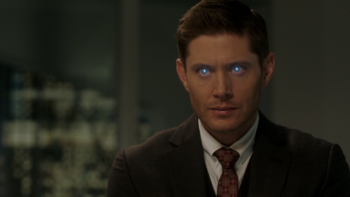 In contrast, while housing the Apocalypse World Michael who is far stronger than the Michael from the Winchesters world, Dean was not only able to remain conscious without any apparent ill effects, he was able to retain control of himself and even use some of Michael's powers as per a deal with the archangel. It was only when Michael betrayed their deal that Dean lost control of his body. Archangels possess the powers and abilities that are inherent in other angels, which are detailed in "Angel Lore," but have additional strengths commensurate with their rank. Their telekinesis, for example, appears to have a wider range than that of the average angel. Gabriel snaps his fingers and flames appear on two candles. Raphael can manipulate electricity. Lucifer can alter temperature. Perhaps the greatest measure of the archangels' strength is their ability to overpower other supernatural beings. Lucifer, unarmed, kills a number of pagan gods with ease using his bare hands and telekinesis (or molecular combustion). Lesser angel have also been defeated by archangels. Gabriel banishes Castiel to another location with a snap of his fingers. Michael does the same to a young Uriel. They may resort to more violent methods to make a point. Raphael beats Castiel, and leaves him bloody in his favorite corner of Heaven when Castiel refuses to give him his allegiance. They fight again at Balthazar's house, and once again Raphael easily overpowers Castiel, throwing him down Balthazar's staircase. When they choose, archangels can kill without fighting. Michael incinerates Anna Milton with a simple touch when she threatens his plans. On separate occasions, Lucifer and Raphael both cause Castiel to explode. Following his return, Lucifer commonly uses this power to kill angels and demons. Archangels can also block the powers of their lower ranking brothers; Raphael prevents Castiel from using his powers on Crowley. When attacked by a lesser angel, Lucifer casually causes him to explode without even paying attention to the angel. During a fight in close quarters with Sam, Dean, and Castiel, Lucifer is able to casually beat all three even though Castiel is armed and he is not. Notably, none of the blows any of the three land cause any harm to the archangel. During a confrontation with Asmodeus, the last of the Princes of Hell, Gabriel effortlessly deflects an energy blast from the powerful demon and incinerates him with just a gesture despite Asmodeus' high level of power, boosted by regular injections of Gabriel's grace and the fact that Gabriel himself is in a weakened state. Archangels can resurrect humans at will, even when out of contact with Heaven. Michael heals Sam completely after he was impaled with a pipe, and bled out. Gabriel, while posing as the Trickster, kills and resurrects Dean dozens of times in a time loop. Lucifer tells Sam that if he killed himself he would resurrect him, and Castiel states that if Anna killed Sam that Lucifer would only resurrect him. After Sam was killed when a vampire ripped out his throat, Lucifer was able to resurrect him with apparent ease, having recharged his grace by feeding on the grace of several other angels. A degree of prescience is also shown by the archangels, though they may not have a complete picture of the future. They know that Dean and Sam are the predestined vessels of Michael and Lucifer. Michael has a glimpse of the confrontation between Zachariah and Dean before it happens, in particular the damage inflicted on Sam and Adam. Lucifer predicts, correctly, that Sam will surrender to him in Detroit within a few months, but he does not see his downfall before it happens. The archangels have an ability to manipulate reality, which Gabriel in particular embraces. Gabriel can construct alternate realities and time loops, and control who is aware of the situation. He can create things out of thin air, including murderous accomplices and duplicates of himself. Gabriel can change the appearance of objects, as he proved when he made a can of diet Orange Slice look like his archangel blade, and can change his own form. Lucifer claims to have taught Gabriel all his "tricks," and uses some of them himself. Lucifer appears to his vessel Nick as Sarah, Nick's murdered wife, and makes him see blood in his bed and his dead child's crib. Lucifer appears in Sam's dreams as Jess as well. He later does the same thing to Vince Vincente by making him see blood in a sink faucet, levitating objects, and impersonating his dead wife. Every archangel apparently possesses knowledge of Lucifer's Cage and how it works, above and beyond the existence of the 66 Seals. Michael understands the prison very well because he cast Lucifer into it. Lucifer, having been imprisoned in the Cage for thousands of years, knew how to escape through the 66 Seals and also by taking advantage of a loophole found in the summoning spell from the Book of the Damned to escape. Gabriel knew that the Cage can be reopened with the Horsemen's Rings, and Lucifer, despite Gabriel's word, knows this too. Raphael may have known of another method to open the Cage, as he intended to reopen it to restart the Apocalypse. Archangels can grant their vessel access to some of their powers even while the vessel is in control, making the archangel effectively act as a power source. In this state, the vessel is also capable of using an archangel blade against other archangels no matter who's in control. God - As his creator, God is stated to be the one being capable of stopping Lucifer and the Apocalypse. While trying to keep Lucifer under control, God proved capable of negating Lucifer's powers without Lucifer even noticing until he tried using them. Archangel Blade - An archangel blade, when wielded by an archangel, is capable of killing an archangel. It is also effective against archangels when wielded by a vessel powered by an archangel whether the vessel or the archangel is in control. The other weapons of Heaven can harm and possibly kill an archangel. Lot's Salt, one of the weapons, turned Raphael's vessel into a pillar of salt, which made it uninhabitable. The Colt can damage, but not kill. Lucifer, who says that he is one of "only five things in all of creation that that gun can't kill." It is not known if the other three archangels are also immune. Archangels may be able to harm each other without weapons, as Michael and Lucifer went unarmed to their confrontation. The Apocalypse World Michael stated that he tore his Lucifer apart in the skies over Abilene during his version of the Apocalypse, and Lucifer, while super-charged, believed he could kill the alternate Michael and Dean simply by smiting them though this failed. Some spells can harm archangels. Kali bound Gabriel to her location by gaining a blood sample from his human vessel, and Castiel attempted to summon Raphael to his vessel using Enochian. Enochian sigils can hide a person from archangels. Holy fire can restrain an archangel. It will not kill them as it would a typical angel, but it can temporarily incapacitate them and force them to retreat to heal themselves. In one case, a line of holy fire held an archangel back long enough for his targets to make an escape. He appeared unable to cross it and seemed to be looking at an impending explosion to free him. In another instance, holy fire distracted an archangel long enough for them to be bound. Lucifer's Cage can tightly secure archangels, as seen with Michael and Lucifer. Despite the fact that angels, under normal circumstances, can't harm an archangel, if they can tap into the power of enough souls, they can banish, or even kill them. The angel banishing sigil is able to banish an archangel as it would any lesser angel. Amara is capable of easily overpowering an archangel and causing them incredible pain and damage. She is also capable of effortlessly pulling an archangel from their vessel. A Hyperbolic Pulse Generator can expel an archangel from their vessel. The Lance of Michael has the power to make all angels die slow, agonizing deaths. The weapon was created by Michael for the sole purpose of making Lucifer suffer in their final confrontation. Extracting the grace of an archangel can render them human and vulnerable to any method of death. Nephilim - A Nephilim, at least one born of an archangel, has the power to harm and even kill archangels. While at full power, Jack Kline severely injured the Apocalypse World Michael and compelled Lucifer to tell him the truth. While using the power of his soul, Jack was able to exorcise Michael from his vessel and destroy the archangel. Ma'lak Box - A magical coffin that can contain anything, including an archangel as powerful as the Apocalypse World Michael. Strong-willed vessels - On a few occasions, a strong-willed vessel has been shown capable of overpowering a possessing archangel and taking back control for a time or even trapping the archangel within their minds for months. Michael using Adam Milligan as his vessel. Michael is the oldest of the archangels. Before his imprisonment in Lucifer's Cage, he managed and ruled Heaven in God's absence. Following the creation of the four archangels, a strong relationship formed between Michael and Lucifer. After the creation of Heaven, archangels, and angels; God created the Earth, and later humans. God commanded all of his angels to bow before man. Lucifer questioned this command and retreated to Michael for support, but Michael would not listen. God then told Michael to exile Lucifer, and Michael obeyed which forever formed a wedge between them. Lucifer was thrown into a Cage and bound with 600 Seals. Sometime later, Michael constructed a plan which involved allowing the 66 Seals to break. Participants included Michael, Zachariah and Raphael. Michael wanted the seals broken so that Lucifer could be released from the Cage, giving Michael the opportunity to finally destroy him. It is later revealed that senior management of Heaven did not share this plan with other angels to avoid rebellion. Castiel was oblivious to this plan at first; he later found out Heaven's true intention and told Dean, but he was soon found and destroyed by Raphael. The 66 Seals are eventually broken and Lucifer is released. Soon after Lucifer's rising, Michael instructed Zachariah to get Dean's permission for Michael to possess him. Due to Dean's repeated refusal to serve as a vessel, Michael stayed in Heaven monitoring the situation, and when Dean was transported to the year 1978, Michael spoke to him through his father John. After months of fighting, Dean wavered in his determination and nearly assented to Michael. 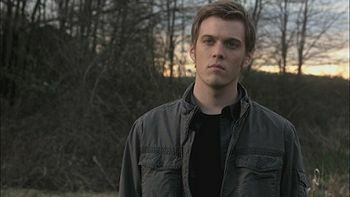 However, Dean and Sam escaped and Michael claimed Adam Milligan's body instead. Michael met Lucifer at Stull Cemetery, where they were interrupted by Dean. Michael threatened Dean, and was temporarily banished by a molotov cocktail of holy oil. Michael returned as Sam temporarily managed to regain control over his body from Lucifer. Michael tried to stop Sam from throwing himself, and therefore Lucifer, into the Cage, and was himself pulled inside. This happened in 5.22 Swan Song. It is speculated that following his imprisonment and Lucifer's re-imprisonment in the Cage, Michael and his brother abused and tortured Sam's soul, which was left behind during Sam's resurrection. Death eventually travels to Hell rescues Sam's soul. In 11.10 The Devil in the Details, Lucifer tells Sam "prison life" hasn't settled well with Michael and implies that Michael has gone insane. God later tells the Winchesters in 11.22 We Happy Few that Michael is in no condition to fight the Darkness. The Michael of the alternate universe known as "Apocalypse World," defeated his version of Lucifer when he rose from the Cage and killed him over Abilene, Kansas. Since then, Michael has led a war of extermination against the human race. After the Lucifer from the main universe crosses into Apocalypse World, he encounters this version of Michael who easily defeats Lucifer in a fight and takes him and Mary Winchester captive. Learning of the main universe from Lucifer's mind, Michael decides to invade and "save" that world as well. To that end, Michael has Kevin Tran use a spell from the angel tablet that requires some of Lucifer's grace to open a portal between the worlds. Lucifer escapes through the portal which closes behind him. From Lucifer, Castiel and Asmodeus learn of the threat posed by this Michael's impending invasion, allowing Castiel to later warn the Winchesters. After an attempt to open a portal between the universes to rescue Mary lands the Nephilim Jack Kline in Apocalypse World, he is captured by Michael who attempts to use Jack to open a portal between the universes big enough to lead an army through. Following Zachariah's failure to trick Jack, the boy escapes with Mary and they link up with human survivors led by Bobby Singer. After repelling an attack by Zachariah, leading to Zachariah's death, Jack becomes determined to kill Michael to protect the remaining humans of Apocalypse World. Jack and Mary subsequently begin leading an active resistance against Michael and the angels. With Jack gaining more and more victories over his angels, Michael decides to enact a plan to dispirit Jack. 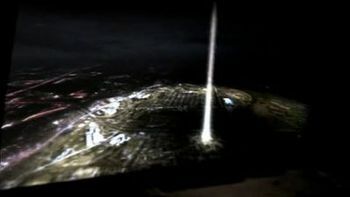 As part of this, he abandons his fortress, leaving Kevin behind with a claim that he has perfected the spell from the angel tablet so that Michael can reach the main universe. Kevin then uses himself as a suicide bomb as a message from Michael. Kevin perfecting the spell was in fact a ruse as Michael remained unable to open an effective portal to the main universe. Michael of Apocalypse World takes Dean Winchester as his vessel. After the Winchesters returned to Apocalypse World to rescue Mary and Jack, Michael discovers the location of their portal and attacks in an effort to follow them through. Though amazed to see Gabriel, Michael doesn't hesitate to kill his fellow archangel in a fight when Gabriel intervenes. 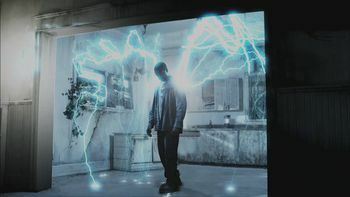 With the portal closed, Michael makes a deal with Lucifer to reopen the portal and travel through so that Lucifer may regain his son and Michael can take over the main universe. Upon arrival in the main universe, Michael assaults the Bunker in an effort to kill the Winchesters. The attack fails when Jack arrives and severely injures Michael. However, Jack is interrupted by the subsequent confrontation with Lucifer after Lucifer's own acts are revealed before Jack can kill Michael. With Lucifer super-charged from Jack's grace, Michael is left too weak to stop him in his injured state. With a common enemy, Michael and Dean make a deal where Dean will become Michael's vessel, but Michael will allow Dean to retain control while Michael powers Dean to defeat Lucifer. With Michael's help, Dean kills Lucifer with an archangel blade, but Michael subsequently betrays the deal, takes full control of Dean and is left loose upon the main universe in the body of his true vessel. After being locked in Dean's mind, Michael is left trapped for a couple of months until Dean is knocked unconscious by the gorgon Noah Ophis. Escaping, Michael possesses Rowena and brutally kills several hunters. However, before he can kill the Winchesters, Castiel, and Jack, Jack taps into the power of his soul and exorcises Michael from Rowena. Jack is able to destroy Michael and absorb his grace, restoring Jack's own powers as a Nephilim. Lucifer's emergence from the Cage. Lucifer is the second archangel, and refers to Michael as his older brother. He aided God and the other archangels in locking away the Darkness and become the first bearer of the Mark of Cain. After the creation of mankind, Lucifer disputed their place in creation with his brothers and with God. These arguments annoyed Gabriel, and became so severe that he voluntarily exiled himself from Heaven. Lucifer's disobedience caused him to be cast out of Heaven. As an act of defiance, Lucifer twisted a human being's soul to create the first demon, Lilith. He was then confined against his will to a Cage. Sometime after Lucifer's incarceration, started referring to him as Satan and the Devil, while demons came to revere him as their creator. In 1972, Azazel possessed a priest at St. Mary's Convent, and sacrificed eight nuns to speak to the imprisoned Lucifer. Lucifer tells Azazel that Lilith is needed to break the 66 Seals that hold him captive in the Cage and that he needs to find a very special child. Lucifer possessing the body of Sam Winchester in the alternate future from 5.04 The End. Lucifer is freed when 66 of the 600 Seals that imprisoned him broke -- the final seal was inadvertently broken by Sam when he killed Lilith. While on Earth, Lucifer, with the help of the Four Horsemen of the Apocalypse, caused chaos and natural disasters, with the goal of destroying humanity. Essential to Lucifer's plan is the possession of his destined vessel -- Sam Winchester. He contacts Sam, playing on their shared experience as younger brothers, and "freaks." Sam and Dean try to kill Lucifer with the Colt, but fail as Lucifer is one of the five things in existence the gun can't kill. At the same time, Lucifer succeeds in raising and binding Death. Sam comes up with a plan in which he will allow Lucifer to possess him and then force him into the Cage. Sam consents to the possession, but finds he cannot take control of his own body. Later when Lucifer confronts Michael at Stull Cemetery, Castiel temporarily dispatches Michael and is killed by Lucifer, but his act gives Dean time to talk to Lucifer. Dean cannot bring Sam to the surface and Lucifer savagely beats him. Then Lucifer catches a glimpse of a toy soldier shoved into a side ashtray of the Impala, and a flood of emotional memories allows Sam to take over. Sam opens the portal to the Cage and jumps in, trapping Lucifer once more in Hell and taking Michael with him. 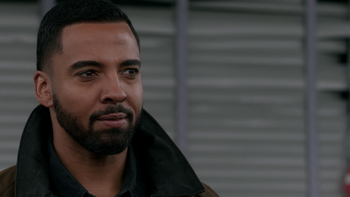 After the release of the Darkness, Lucifer is able to reach out to Sam in the form of visions to draw him to the Cage and works with Rowena to escape. Lucifer is able to escape the Cage by possessing Castiel who says "yes" because Lucifer claims to be able to defeat the Darkness. Lucifer regains control of Hell but keeps his true identity a secret from the Winchesters until they go after the Hand of God. The Hand's power was expended in 1943 and Lucifer is banished by Sam, leaving the Winchesters determined to hunt down Lucifer and free Castiel from his control. After recovering from his banishment, Lucifer begins searching for another Hand of God and working on taking control of Heaven as well as Hell. After a failed attempt to exorcise Lucifer from Castiel, Lucifer is captured by Amara and brutally tortured before being rescued by Sam, Donatello Redfield, and Metatron. Afterwards, Lucifer is reunited with God for the first time in millennia and is healed by his father. On the Winchesters' insistence, God and Lucifer sit down and reconcile with each other, after which Lucifer allies himself with the Winchesters and God against the Darkness. During a final attack on Amara, Lucifer is able to bring Amara to her knees following a combined attack by witches, angels, and demons, but Amara recovers and fatally wounds God. When Lucifer tries to save his father, Amara yanks him from his vessel, leaving Lucifer's fate unknown to even Castiel. 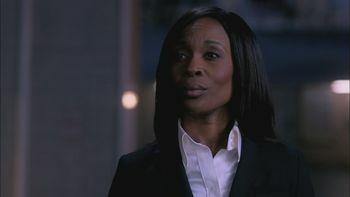 Lucifer is revealed to have survived his expulsion by Amara and begins searching for a new vessel that could hold him. He eventually possesses aging rock star Vince Vincente, a possession he attempts to have Rowena make permanent. However, Rowena betrays him, casts a spell to accelerate Vince's decay, and banishes Lucifer to the bottom of the ocean. Lucifer returns and uses an old feather to heal himself. Lucifer then sets out to kill everything in his path in revenge for God abandoning him again, burning out Vince in the attempt. Lucifer then goes on to possess the President of the United States Jefferson Rooney and conceives a Nephilim with Kelly Kline. Using a device from Arthur Ketch, Sam is able to exorcise Lucifer from Rooney while Rowena performs a spell that apparently returned Lucifer to his Cage. Unknown to everyone else, Crowley perverts the spell in order to use Lucifer for his own purposes. As a result, Lucifer is instead returned to his old vessel Nick, repaired and upgraded by Crowley to permanently house Lucifer as his prison. An attempt by Lucifer to escape reveals that Crowley has placed a binding spell upon Lucifer's vessel, leaving him under Crowley's control. Regularly in contact with Dagon about his son, Lucifer exposes his survival to the demons under the pretense of accepting Crowley's control and enlists the aid of Drexel in breaking his bindings. Following the death of Dagon, Lucifer escapes his bindings and apparently kills Crowley. As his son's birth comes, Lucifer battles the Winchesters, Crowley, and Castiel for control of the child, resulting in the deaths of Crowley and Castiel. Lucifer is ultimately trapped in the alternate universe known as Apocalypse World alongside Mary Winchester. Trapped in Apocalypse World, Lucifer is captured by that world's version of Michael. From Lucifer's mind, Michael learns of the main universe and develops an interest in invading. By extracting some of Lucifer's grace, Michael is able to open a portal between the worlds that Lucifer then escapes through. In a weakened state, Lucifer attempts to form an alliance with a resurrected Castiel to battle Michael, but they are captured by the last Prince of Hell Asmodeus. By working with Castiel, Lucifer manages to escape the Needham Asylum and sets out to recharge his grace. Following a meeting with the angel Anael, Lucifer becomes the King of Heaven, but finds himself dissatisfied with the role and eventually abandons it in favor of searching for his son. After being captured by Gabriel and Rowena, Lucifer is used as a power source to open a continuous portal to Apocalypse World. Escaping, Lucifer resurrects Sam and makes a deal with him in order to get to know his son. 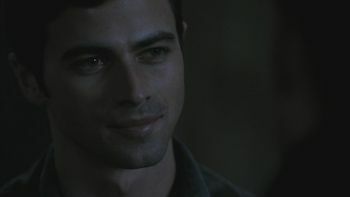 Lucifer bonds with Jack, but is purposefully left behind in Apocalypse World by Sam, where he makes a deal with Michael. Returning to his own universe, Lucifer absorbs Jack's grace to become more powerful than ever before. With Lucifer poised to destroy everything and remake the universe as he wishes, Dean becomes the vessel of the Apocalypse World Michael. With Michael powering him, Dean is able to finally kill Lucifer with an archangel blade, ending Lucifer's long reign of terror. Lucifer's vessel Nick survives the archangel's destruction and is left haunted by memories of what Lucifer used him to do as well as some Lucifer-like mannerisms. Raphael was the protector of the prophet, Chuck Shurley, and killed Castiel for attempting to stop the Apocalypse. Shortly after the breaking of the 66 Seals and Lucifer's release from the Cage, Raphael arrived on Earth inhabiting his vessel, Donnie Finnerman, and ended a conflict between angels and demons near a Pump 'n Go gas station in Maine. After he finished with the demons he immediately abandoned his vessel, leaving him catatonic, and ascended back to Heaven. The resurrected Castiel believed Raphael knew God's location, so with Dean's help he summoned Raphael and trapped him in a circle of holy fire. However, Raphael denies knowing where God is and speculates that he's dead. Castiel and Dean leave him in the circle of flames. Archangel Raphael's second female vessel. At some point, Raphael manages to escape from the circle, and when the Apocalypse is stopped, he is prepared to restart it at all costs by releasing Michael and Lucifer. Castiel opposes him, and they find themselves in the midst of a civil war. During a skirmish Donnie Finnerman's body was destroyed by Balthazar using Lot's Salt, leaving Raphael in search of a new suitable vessel. Raphael then sends an angel named Virgil to kill Balthazar and anyone else who allied with Castiel. He eventually claims a woman as his new vessel. After being threatened with Heaven's weapons by Castiel, Raphael flees. Raphael is later destroyed by Castiel with a snap of his fingers after Castiel absorbs the power of all the souls of Purgatory. After being created by God, Gabriel dwelt in Heaven with the other archangels, but fed up with Michael and Lucifer's constant bickering and the direction it was headed, he sacrificed his position in the Host as God's greatest messenger and retreated to Earth in self-exile. Dean and Sam Winchester first encountered him while he was posing on earth as an immortal demi-god known as the Trickster. As the Trickster, Gabriel went around giving people what he judged to be their "just desserts," punishments which ironically matched their original crime. The brothers believe they killed him with a wooden stake dipped in the blood of one of his victims, he tricked them, and survived. A year later the Trickster trapped them both in a time loop where Dean died every Tuesday in different ways that proved unavoidable by any means. Around Dean's hundredth death, Sam realized who is responsible for everything and confronted the Trickster. Sam demanded that the 'demi-god' free them from the loop. He reluctantly obliged. While in the real world, Dean died again, this time for good. Sam spent six months tracking the Trickster. The Trickster assumed the form of Bobby Singer and lured Sam to him. Upon realizing that it was the Trickster, Sam pleaded with him to resurrect Dean, and he agreed. Two years later, when the brothers investigate the case of an abusive husband killed by the Incredible Hulk, the Trickster traps them in an alternate reality of TV shows. He tells them they need to "learn to play their roles", referring to their destiny as vessels for Michael and Lucifer. Sam and Dean start to suspect that the Trickster is more than he appears to be, and when they trap him in a ring of burning holy oil, he reveals himself to be the archangel Gabriel. He claims that he "skipped out of Heaven, had a face transplant," and is berated by Dean for refusing to stand up to his family. Later Gabriel comes to the aid of the Winchesters and a group of gods, trying to prevent a confrontation between them and Lucifer. When Lucifer arrives, Gabriel gives the few survivors an opportunity to escape while he faces his brother. Gabriel proclaims that God was right in declaring that humans are better than angels, and that Gabriel has chosen their side in the conflict. He tries to attack Lucifer from behind through trickery, but Lucifer stabs him with his own archangel blade. Though Gabriel reappeared as part of Metatron's plot to trick Castiel, God confirms that he is dead and is unable to bring Gabriel back to aid in the final battle with Amara. Eight years after his apparent death, Gabriel is revealed to be somehow alive and a prisoner of the Prince of Hell Asmodeus in the Needham Asylum. Ketch discovers that Asmodeus has been injecting himself with Gabriel's extracted grace to fuel his own powers. Following a brutal beating by Asmodeus, Ketch rescues Gabriel and steals his extracted grace as well as the archangel blade, bringing all three to the Winchesters, who use Gabriel's grace to open a portal to another universe. As Sam and Castiel attempt to treat a traumatized Gabriel, they learn that he faked his death at Lucifer's hands to abscond from his responsibility once more. During an attack on the Bunker by Asmodeus, Gabriel fights back and incinerates the last Prince of Hell. He refuses to have anything to do with the coming battle against an alternate universe Michael and departs once more. After seeking out revenge on Loki and his family, Gabriel agrees to join with the Winchesters against Michael. Gabriel aids in the capture of Lucifer to power the portal and joins the mission to Apocalypse World where he meets his nephew for the first time. With the return of Lucifer, Gabriel joins in the effort to evacuate many of the people through the portal to the Winchesters universe. Upon being found by Michael, Gabriel decides to stand his ground with Lucifer to buy his friends time to escape. After a fight, Gabriel is killed by Michael with an archangel blade, but succeeds in buying enough time for the evacuation to finish and the portal to close, stranding Michael and Lucifer in Apocalypse World. At one time, Gabriel may have owned an angelic weapon called Gabriel's Horn of Truth. At present, only four archangels are known to have existed (Michael, Lucifer, Raphael, Gabriel) and only two are currently known to be alive: Michael who is trapped in Lucifer's Cage and Apocalypse World Michael who made his way from his world and gained possession of Dean's vessel. Lucifer was killed by Dean Winchester who granted his consent to AW Michael to defeat him with an archangel blade, but he reneged on their deal and took full control of Dean's vessel. Gabriel was killed by AW Michael with his archangel blade in Apocalypse World. Raphael was ripped apart on a subatomic level by Castiel when he absorbed the Leviathans and the countless other souls from Purgatory. In an "personal note" of the demon tablet, it is said that Metatron is an archangel. Though he was never asked, he pretty much denied the statement, as he says that he was from Heaven's secretarial office before being chosen to become the Scribe of God. While at first it was unknown if an angel banishing sigil would work on an archangel, Sam managed to banish Lucifer with one in 11.14 The Vessel, proving the sigil does in fact work against archangels. The banishment of Lucifer was also the first successful use of the sigil since 9.01 I Think I'm Gonna Like It Here. ↑ 17.0 17.1 11.09 O Brother, Where Art Thou?